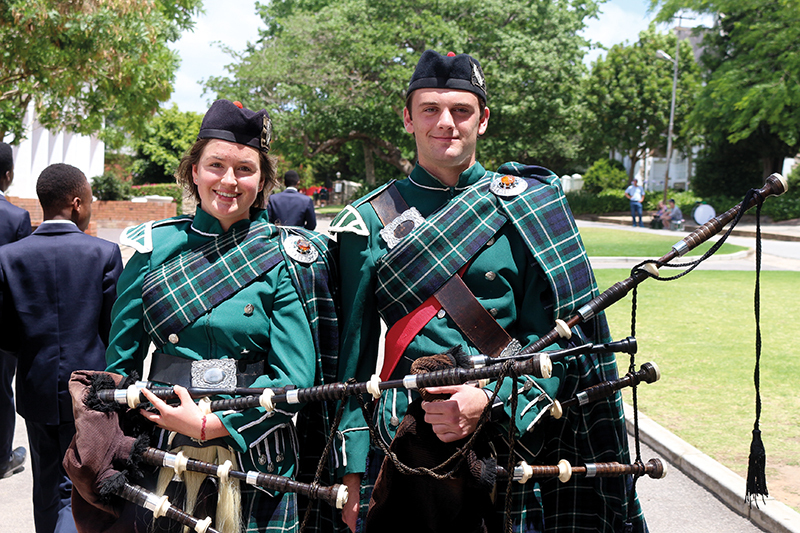 The St Andrew’s College Pipe Band celebrated its 80th year of existence in 2018, and is believed to be the oldest school pipe band in the country. Girls from DSG have played in the band since 1995, when Christine Harris became the first DSG piper, and since then a good number of girls have played in the band, several of them holding the position of leading side drummer. In 2019 another historic milestone was reached, when Lucy Ter Morshuizen became the first DSG girl to hold the top position of Pipe Major. Originally taught by another DSG pupil, Kaeleigh Vetch, Lucy began learning in March 2015, when she was in Grade 7. Her first performance in the band was at the beginning of last year, and she has played in almost every band performance since. She has enjoyed some success in solo competitions too, notably at the Knysna Celtic Festival in February this year. Lucy takes over from Jonathan Campbell who was Pipe Major in 2018.